The iPad’s built in Notes app has been around for years, largely unchanged until fairly recently. Notes offers a quick and easy way to create a note on the go. The ability to sync via iCloud is a nice plus and works very well between your iPad, iPhone, and Mac. This seamless integration can be very useful when you are bouncing from one device to another and need the reliability of knowing your information will be available when you need it, no matter the device. You can also access your notes from any computer with an internet connection. The current version of Notes adds some nice touches such as the ability to add photos and drawings with your fingertip or an Apple Pencil (for iPad Pro users.) Perhaps one of the most useful additions is the ability to create grocery lists and other routine checklists. Notes also takes security seriously with the ability to lock specific notes. Notes is also deeply integrated into macOS and iOS allowing you to quickly export web clips to it. The new sharing feature lets you add other people to the note, and they will see changes you make. Notes is quite limited in some ways. For example, there is no way to annotate over an existing file such as a photo or PDF since the writing/drawing feature is a separate part of each page. Also, there is no audio recording function, and it’s a little tricky to sort folders. With handwriting being such a highlight of iPad Pro and Apple Pencil, it comes as a bit of a let down that the inking experience of Apple Notes isn’t that great. You have the choice of a ballpoint pen, a highlighter/marker, or a pencil with a selection of 24 colors. There’s no mixing palette and no choice of pen widths. The pencil option offers a cool way to angle the Apple Pencil for shading, so why are we stuck with literally a single width for the other tools? This confirms, once again, that Notes is good for very basic uses but it’s far from being as mature as other note apps. OneNote is considerably more powerful than the standard Notes app. Notes are arranged in any number of individual notebooks where you can create individual tabs to hold related pages of notes. OneNote employs a freeform canvas so that you have a virtually unlimited workspace to type, draw, annotate PDFs, insert photos, tables, or audio clips, and much more. For iPad Pro users, the drawing and inking is fast and smooth with an Apple Pencil. Syncing via OneDrive works very well. Of course, this depends on the speed of your network connection, but OneNote did just fine in my tests. OneNote offers iPad, iPhone, and macOS compatible versions as well as Windows compatibility. Similar to Notes, OneNote also offers password protection to add a layer of security to your notes. This is a great option to help maintain privacy of your important notes while allowing you to select a password which will then sync across all your devices. On iOS devices with Touch ID, you can use this to unlock protected files. Microsoft has created the standard for professional word processing, spreadsheets, and presentation tools with the Office line. The latest versions of these iOS apps are, to put it simply, fantastic. The consistent look and feel between Word, Excel, PowerPoint, OneNote and the others is exceptional. There are a few concerns with One Note. First of all, I find it a bit peculiar that there is no way to quickly sort your notes (say alphabetically or by date) other than by manually dragging each and every note. Also, when you search for something, OneNote does not have the ‘memory jogging’ effect of scanning through a list of titles or dated notes. Some of the drawing characteristics with OneNote are still quite basic—for instance, there is no way to layer highlight colors to darken or noticeably alter their appearance. Also, with OneNote, you can’t print a note from an iPad. Yes, really. The official workaround from Microsoft is to email yourself the note as a PDF, open it in your Mail app, and then print from there. Lastly, OneNote needs to go on a diet. The app alone weighs in at a hefty 251 MB which is quite a chunk of room for a note-taking app. While there are a few more tools and features, the relative size is out of proportion with similar apps and it would be nice to see the app streamlined at some point. While the former two options offer a nice selection of tools for basic or more in-depth note taking, Notability handles and feels more like a real-world notebook. Inking is beautiful and fast, and it comes in a variety of pen widths and colors as well as highlighting. 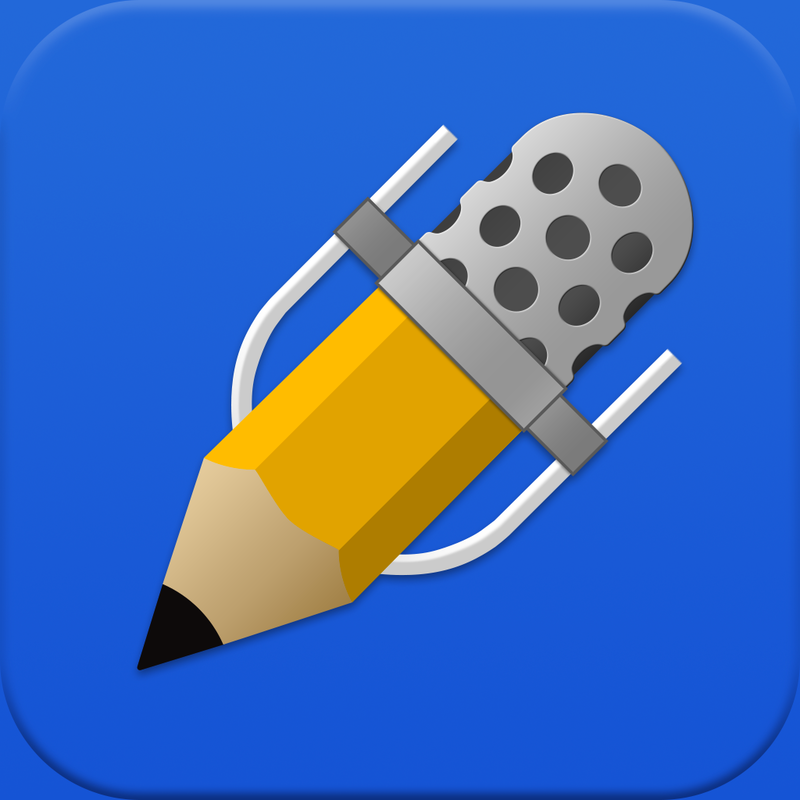 Notability organizes your notes in a column on the left side of the app in sections. Each section can contain multiple notes, while you can arrange sections however you like with dividers. A huge advantage is the ability to sort your notes automatically by name, modified date, or creation date. A simple tap on any of these three options sorts your notes instantly. One somewhat unique and potentially very useful tool is the ability to record audio along with your note in Notability. It works like this: When you select the record function, ambient audio begins recording while you take notes, draw, sketch, or add anything else to your note. Later, you can tap on any word, sentence, diagram, or drawing and your recorded audio will begin play back from that point. This is very useful if you’re recording, say, a meeting at work. Notability not only offers an iPad version, but it also has iPhone and macOS counterparts and keeps everything in sync via iCloud. You can also connect to your Dropbox, Google Drive, or Box accounts easily, and simply share and export notes via email, with or without the included audio. Notability also lets you choose from a wide range of paper and color options. As good as Notability is with organizing and creating notes, it is not without some flaws. First, it’s reliant on iCloud for syncing your notebooks between devices. Even though iCloud is a great service, not everyone sees a need for having an account. Unfortunately, Notability offers no other option for syncing across your iPad, iPhone, and Mac. Curiously, it can use services including Dropbox, Google Drive and Box to back up your notes so why can’t it use these services to sync as well? Keeping this in mind, take note (pun intended) that you can back up from only one device at a time. For example, if you back up your notes from your iPad and then enable backups from your Mac, your iPad auto-backups will be disabled. Another issue that I noticed with Notability is a strange inconsistency in font sizes across devices. Whereas Apple Notes and One Note presented a nice, legible size of text or drawings, Notability seems to scale the font size down requiring you to zoom in to see it well. Not a huge thing, but something that can become annoying after a while. The chart below shows a comprehensive comparison between the three apps and their capabilities. *One Note imports audio as attachment. Notability records ambient audio tagged to written content. Terry Jarrell is an Apple consultant, Rocket Matter Certified Expert, and instructor based in Florida. Terry has been supporting legal professionals for more than a decade, and he also provides Florida Bar accredited CLE instruction and personalized technical services.